Upon invitation of the Dominican Republic Baptist Convention Dr. Jerry Graham, long time member of First Baptist Church of Huntsville, AL, led a medical mission team to share the love of Jesus with people in the Dominican Republic and some Haitians in communities on the border with the Dominican Republic. Members of First Baptist Church, Madison, AL, First Missionary Baptist, Huntsville, AL, Plantation Baptist Church, Plantation, FL, First Baptist Church Huntsville, AL and Baptist brothers and sisters in the Dominican Republic joined together to provide free medical, dental and vision care for the poorest in these countries and to share the Gospel of Christ Jesus. 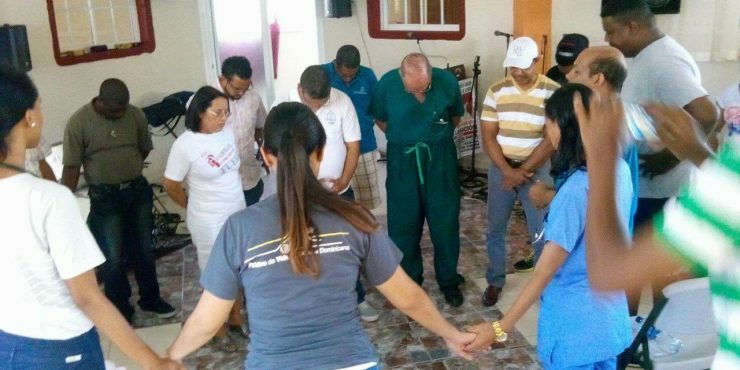 As Dr. Graham said in English and learned to say in Spanish, “It’s All About Jesus!” ( “Todo es acerca de Jesus!”) Eight-one person came to know Jesus as their personal Savior during this trip and over 2000 persons received care through the medical, dental and vision clinics. Glory to God for what He did!